It's quite common to find conference video recordings on YouTube and slides presentations hosted on SlideShare. Would it not be better to have both at the same place and synchronized? Slides quite often need spoken explanation. And how about getting explanation to a specific slide only? No problem if video and slides are synchronized. 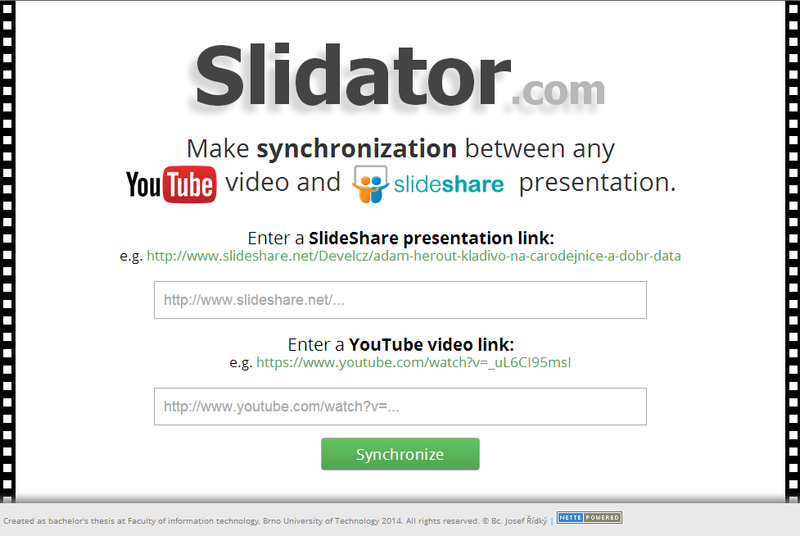 The website Slidator.com is about getting any YouTube video easily synchronized with SlideShare. You only need to enter a YouTube video link and a SlideShare presentation link. After that, data is loaded and you can start synchronizing the video with slides. This is done by either dragging the boundaries of the selected slide or through key shortcuts. When you finish the synchronization, you can download the XML containing timings for each slide. You can also immediately play the YouTube video with synchronized slides in the SuperLectures player. And embedding this player on any website is easy. So, give a try to Slidator!